Often an experienced motorcyclist rides defensively knowing that many motorists fail to think of motorcycles on the road when making a manoeuvre. A momentary lapse of concentration behind the wheel can lead to catastrophic results to a motorbike rider. A common motorbike accident scenario is where a motorist either pulls or edges out of a side road or crosses over a dividing white line. In anticipation of a collision, the motorcyclist swerves to avoid a potential accident. 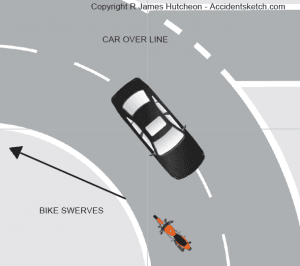 Sometimes the avoidance works but on other occasions the motorcyclist will not avoid the being hit by the car or alternatively, they will avoid the collision but will still be injured by departing from the bike or colliding with another object.